What is Twitter for? Is it a network of – for want of another term – ‘normal’ people who discuss amongst themselves? Or is it a way for all of us to slavishly follow the rich and famous? Two things are extraordinary. The first is that there is no ‘Skip’ button – you must follow 5 people before you proceed. Secondly, the people it suggests you follow are all celebrities – Justin Bieber, Ashton Kutcher, Justin Timberlake etc., all presumably having paid to have their accounts displayed here. There is also no effort whatsoever to target this – Twitter has my IP address because it defaults in the settings to setting Denmark as my location. Why can it not even show some potentially relevant local content? 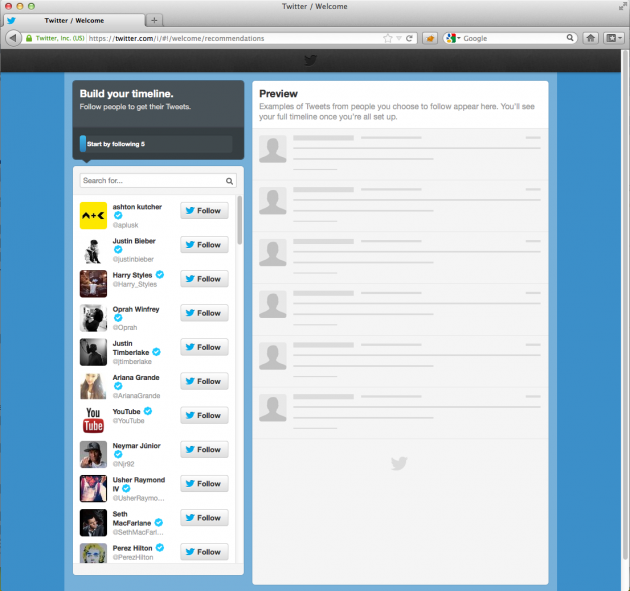 Now, of course you can get around this, by just going to twitter.com and not completing the signup process. But the very nature of the network is called into question by this signup process. When I joined Twitter in November 2008 the network offered a blank canvas you could fill what you wished. Now it seeks to push you ever more down a line that it can monetize, and that means a less reciprocal, more follow-the-stars kind of approach. I’m not a fan. Jason – interesting! I haven’t tested it in depth – I could have a go with different IP addresses and browsers and see what I get. I was using Chrome on Mac from Denmark in this case. Interesting that that happened to you because I just created an account for my Model UN team today, and I did not have the same experience. It did not prompt me at all to follow any users. Do you think that it might be different for users in Europe (I’m in the USA)? Hi Jon, this is exactly one of those things why I think Twitter has no future in the long-term (without a *radical* change in their attitude). This example shows again that they simply don’t care about users. They don’t spend a minute thinking about details on how to improve user experience (while Facebook does that day in and out). This is shown by their website, their third-party client / API policy, their inability to offer a long-tail advertising model. And finally by their sign-up process.